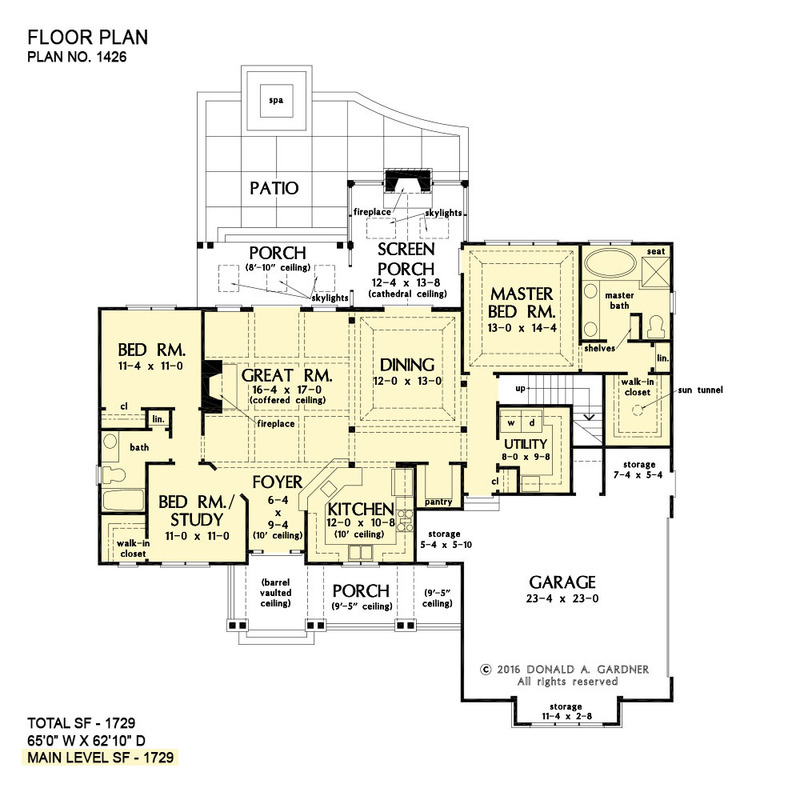 Rustic details compliment this efficiently designed home plan. The open floor plan lives large and the kitchen enjoys front views and a spacious walk-in pantry. 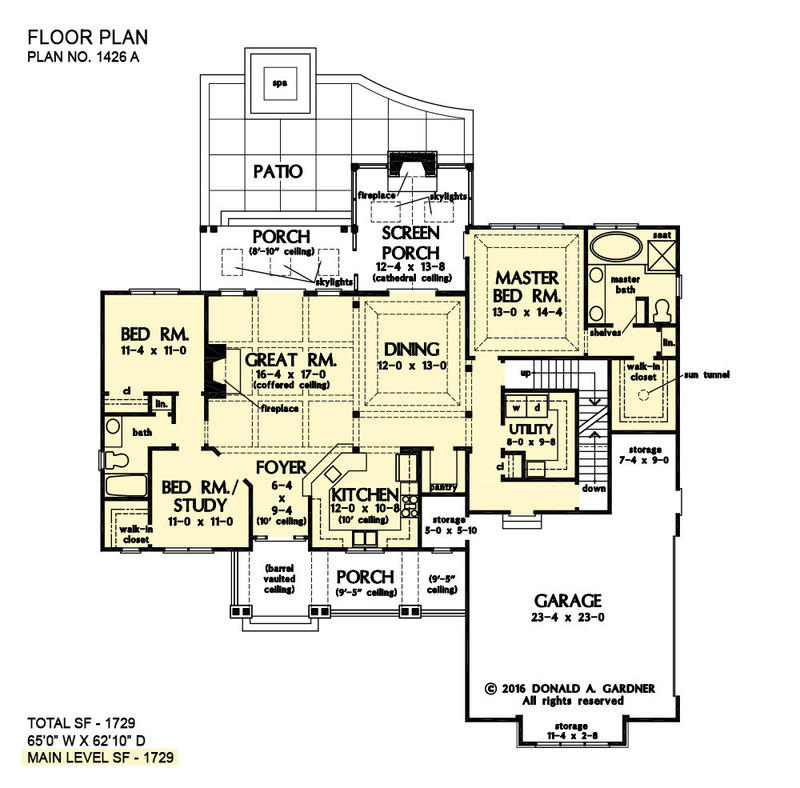 Outdoor living is abundant with a screened porch with fireplace, an open porch, and a patio with spa. The master suite offers private access to the rear screened porch. 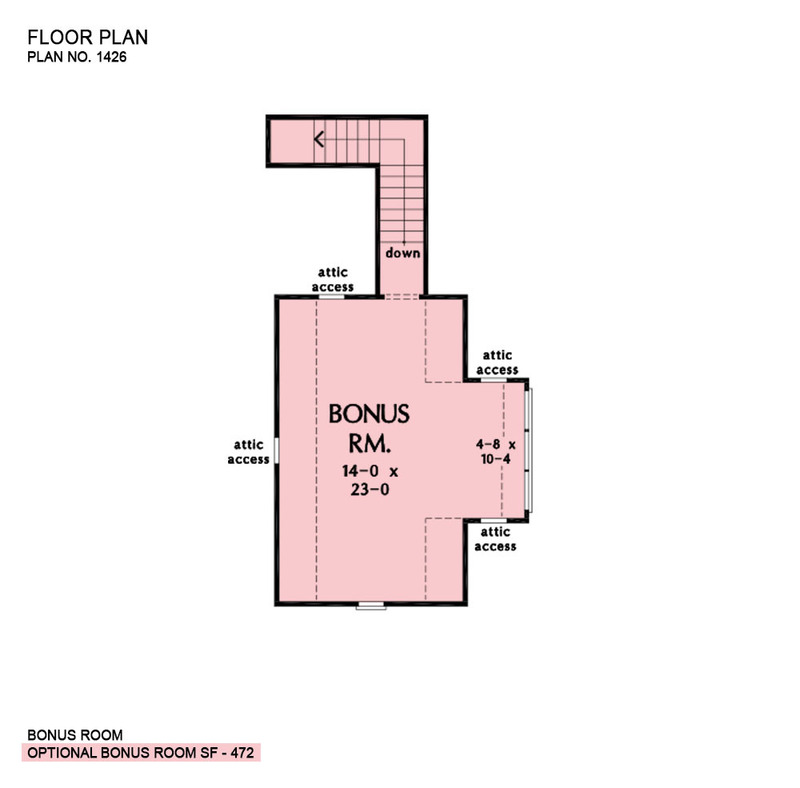 An additional bedroom, study, and full bath round out the floor plan. Porch - Rear: 127 Sq. Ft.
House Dimensions: 65' 0" x 62' 10"
Foyer (Flat): 6' 4" x 9' 4" x 10' 0"
Great Room (Coffered): 16' 4" x 17' 0" x 11' 0"
Kitchen (Flat): 12' 0" x 10' 8" x 10' 0"
Utility Room (Flat): 8' 0" x 9' 8" x 9' 0"
Garage (Flat): 23' 4" x 23' 0" x 0' 0"
Garage Storage (Flat): 7' 4" x 5' 4" x 0' 0"
Master Bedroom (Tray): 13' 0" x 14' 4" x 10' 6"
Bedroom / Study (Flat): 11' 0" x 11' 0" x 9' 0"
Bedroom #3 (Flat): 11' 4" x 11' 0" x 9' 0"
Porch - Front (Flat): 26' 4" x 7' 4" x 9' 5"
Porch - Rear (Flat): 17' 4" x 7' 4" x 8' 10"
Deck / Patio (None): 30' 8" x 17' 0" x 0' 0"
Porch - Screen (Cathedral): 12' 4" x 13' 8" x 14' 2"
Garage Storage Bay (Flat): 11' 4" x 2' 8" x 0' 0"